These 9mm Luger rounds are great for a day at the range. They function great and they have above average accuracy so they make for a great training or plinking round. You're sure to love opening up every box of this ammunition whenever you take it to the range! Today I want to talk about what I think is one of the most under-rated brands of ammo out there, and that's S&B. S&B is a Czech company that stands for Sellier-- Sellier & Bellot-- Sellier-- Sellier & Bellot, sound it out. Zellier-- Zellier-- are you saying Zellier? Sellier & Bellot. S&B is a Czech company that's been around since 1825, so they have just as much experience making ammo as some of the more mainstream, domestic companies. They were recently bought by a company that also owns Magtec who's also known for quality ammo. The ammo I tested is a 9 millimeter, 115 grain, full metal jacket. It comes in this nice small box for 50 rounds, so it's really compact and it doesn't take up a whole lot of room in your range bag. The bullet is lead with a full metal jacket. It's a brass case, boxer primed, non-corrosive, so it's not like surplus military or anything. It's factory, new ammo. It's got a sealed primer-- you can see that red stuff there, so you know it's safe from the elements. It's not going to get moisture in there and ruin your ammo. And the brass case is completely reloadable so you really get your money's worth out of this stuff. I tested this ammo in a bunch of different guns. Everybody I know has a 9 millimeter, so we just rounded them all up and took them out to the range and ran a couple hundred rounds through them. I didn't have any problems with the ammo in any of the guns. Accuracy was great. We did a little bench rest test at 15 yards. It was really consistent and 100% reliable. No failures to feed, failures to ignite, no light strikes or anything like that. It burned really clean. I didn't have any problem cleaning up the residue when I was done. And you notice with the red sealant on the primer, some other companies that have that leave a really nasty red residue behind in your chamber, but I didn't see any of that with the S&B ammo. If you have any doubts just check out the user reviews. There are a ton of them. I think you'll like what you see. If you're looking for some inexpensive, quality ammo that's brass cased and has some of the same qualities as some of the domestic ammo you're used to shooting, then try S&B. Just started into my second thousand rounds of S&B and this ammo has been great. I'm running about 60/40 through my 20+ year old 92fs and my 6 month old Shield. Not a single malfunction from either. Will definitely be buying more. Lucky Gunner has been first rate getting my orders shipped quickly. I bought this ammo because it was the cheapest available option with brass casings while reviewing the best cheap 9mm ammo for range practice. I had no ammo related issues after shooting 1000 rounds of this (mostly through a very dirty SIG P320). Bought 1000 rounds of S & B 115 FMJ, and it is, by far, the highest quality, cleanest burning ammo of any kind I've bought. I normally reload to my own specs. which are better than can be bought. Not in this case. S & B ammo is clean on the outside looking polished and leaves very little residue or smoke when shooting. There has not been one failure so far about half way through the 1000 rounds. The price is competitive so this is my new "new" ammo. It puts other ammo on a lower level of quality, IMO. Ran 300 rounds through my Glock 19 Gen 5 and my S&W 2.0. Ammo ran smooth, Burns clean. Ordering more today. First time Customer, Fast shipping and a great experience. Thank you. Shot 800 of 1000 rounds. Not a single problem, from my Glock G22 with a conversion barrel. High quality ammo. Nice small boxes, easy to carry around. Try it, you'll like it. What a deal and SO PRETTY! Most beautiful ammo I’ve seen lol... but really, flawless functionality and 400+ ft lbs is hard to beat. I ordered 124 gr last time and it is my fav.... you will love this stuff! S&B ammo was found to be exactly as other reviewers found it: predictable, clean burning, no FTFs. I have shot about 150 rounds out of 1,000 rounds purchased so far. Excellent performance, no issues. The cartridges appear to be much cleaner looking and more polished than other brands, and I appreciate the tighter, smaller cartridge boxes - less waste, easier more efficient storage. For the price, S&B 9 mm ammo cannot be beat. S&B 9mm ammo - Two Thumbs Up! Great ammo: high quality; reliable; shoots clean; no malfunctions related to ammunition after several thousand round cases. I use S&B for my other pistols as well with the same results. I'm amazed at the quality of this ammunition compared to others I've used in the past. Cleaning my pistols after a day at the range with this ammo is much easier and takes less time. Lucky Gunner never disappoints with the speed in shipping and quality of the packing when I receive it a few days later on the West Coast. I'll be ordering more! Burned through a case in a month with two CZ's and a Glock. C'mon S&B give me a malfunction now and then. I like to practice live. Can't wait to try their 124 gr. Have purchased over 2000 rounds and will continue to buy more! Runs flawlessly through my Sig(s), XDS, and Beretta. Good reloadable brass that is clean. 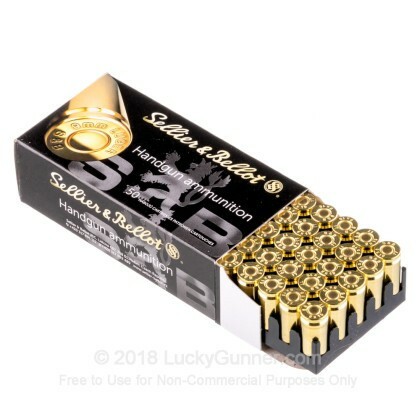 To be honest I never heard of S&B before, and the only reason I purchased this ammo was because it was the only ammo that had multiple reviews from 2018. Other ammo only had reviews dating back to 2017 (in my book that is outdated). With that said I pulled the trigger (no pun intended) and buy this ammo and I am a happy camper. I only shot about 500 of the 1000, but they all shot great. The ammo was clean and looking like a brand new penny. If you are deciding which bulk ammo to purchase for the first time, take my word for it and give S&B a try. My next order will certainly be S&B again. So for a case of 1000, this stuff is only slightly more expensive than steel cased ammo, and much higher quality. S&B is definitely going to be my go to for the foreseeable future. Plus, the price from LG on this stuff is awesome. I’ll probably be buying another case before they run out. I've but 1000 rnds of this ammo through my 9mm and 45acp no issues at all! These run a bit hotter than the average 115-gr; not quite HOT but not quite typical either. Fantastic range ammo, maybe even match ammo. No FTEs/FTFs, burns real clean, and goes 'bang' every time you pull the trigger. 200 rounds in an M&P 2.0 5-inch with zero issues. Already a heck of a deal at normal prices and a massive steal when on-sale -- grab 'em while you can! You won't regret it! Great value, no miss fires, or failure to feed. highly recommended. After 3000 rounds without a single problem, I can't imagine a reason to buy another brand. very good price too. Also very impressed with Lucky Gunner. I've ordered 4 times in 5 months, and each order has shipped the same day, arriving within 48 hours. Great ammunition and fair price. 1000 rounds all worked great, shot clean. Will buy again and again. I wanted to like this stuff; it shoots straight and clean. BUT, I've had about 1% misfires, so has my wife, and worse yet, two of her misfires jammed the gun. From now on, I'm giving this a miss. I'm at the gun range about twice a week, and I'd used several different brands, before this one went on sale. Now....I only buy this brand. First, the price is great. Second, I haven't had any Failure to Fire or Failure to Eject issues, and as I mentioned, I'm going through about 800 to 1000 rounds a week. It's awesome. Powerful ammo excellent quality same muzzle energy as 40 and 45...Impressive! Love this stuff. I use it in all my full size pistols. Not one single misfire in over 4000 rounds. A bit overpowering for my Taurus 709 slim. Broke a recoil spring. They’re free, not to worry. It shoots at plus p velocity. Use in strong firearms. I use lower velocity ammo for our 709s. I purchase a case, they arrive fast and the box was way smaller than what I expected. The ammo feeds and loads well in my Walther PPQ M2 9MM. No issues what so ever. I order another case. Great quality & value. Never a misfire in ten thousand rounds. Great quality and value. Never a mess bar in over 10,000 rounds fired through five different guns. When LG put these on sale I jumped on it. I've been shooting S&B ammo for years and highly recommend it. Buying from LG is always a good experience, with fast shipping and excellent communication. Great quality round for the price. No problems . Clean rounds. Thank you Lucky gunner. Lucky gunner had my ammo on my doorstep in less than 48 hours. Not a FTF or FTE and virgin brass for the same price as my range's re manufactured stuff. Won't buy my ammo anywhere else from here on out. Amazon-like service from Lucky Gunner. 1,000 rounds with no problems using my Baretta 92A1. Packaging a fair amount smaller than other brands which is a plus for transport - very pleased and highly recommend. I have been shooting Sellier & Bellot 9mm 115 grain for years. I never have any jams or misfires with it (caused by the ammo). I have put 3000+ rounds through each of my Sig P226, Beretta 92fs, M&P Shield, S&W 908, Thureon 9mm with no issues. The Ammo is cleaner than most ammo at the same price range. I have used 200 rounds in my S&W Shield with great results. These are high quality rounds. No FTF, stovepipes, or other problems in 500 rounds through Ruger SR9, Ruger LC9s Pro, and Taurus PT-111. Burns clean, 115g FMJ feels good, consistent. 50rd 9mm boxes are small enough to allow more boxes to fit in my range ammo box. This S&B ammo is as good as any FMJ practice ammo I have used, regardless or price. I will buy more. This was my first use of Sellier & Bellot ammunition. It arrived in a surprisingly small box compared to all the rest of my 9mm ammo, and a full box went through my XDS with no problems at all. Looking forward to using the rest of the ammo!! Great for practice or fun competitions. I rely heavily on Lucky Gunner for fast delivery of quality ammunition. Thank you. Fast order fulfillment and shipping. Will buy again. First purchase on Luckygunner.com and will buy again. Thanks! No problems. Good value. Will buy again. Why buy "wimpie" ammo from the big three when you can buy this S&B for the same or lower price and it out preforms that "wimpie " ammo ten fold . It has MV and ME not too different from some of the self defense ammo on the market today. Try it , you'll like it , i'm sure . I found this to be great product. I use it for range practice and have had no issues. Great range training and practice ammo. Excellent target ammo. Some failure to detenate with one gun which has a particularly light trigger but much cleaner than ammo that does. First purchase from Lucky Gunner. People Lucky Gunner are quite pleasant to deal with and very helpful. Ammo arrived quickly (2 days). Ran 200 threw my Glock 19. Not one problem. Thanks lucky gunner. You've got my business. The S&B 115 FMJ has about the closest ballistics you can get to a personal defense round, therefor making your target practice sessions far more realistic to you PD ammo. Great ammo and as a competitor I go through a few 1000 rounds a month and I do not remember the last time I had a FTF or FTE. It just runs smoothly and flawlessly in all my Glock's, Sig's and Springfield's. Lucky Gunner has always been dependable and reliable with fast shipping and ammo availability. Amazing high quality ammo for the price. Shoot 300 rounds lately .no issues great ammo.super fast shiping. Wont be my last purchase here! Great ammo for practicing. Feed through Glock 19 with no issues. I did find them at a lower cost about 2 weeks after i had already purchased, so i would suggest going to there site often & check on there prices. that's if your not in a rush to purchase. SB9A Now Available in Bulk - Excellent!! Happy to see you are now offering this great ammo in bulk - 1000 rounds. Love it! It will definitely be my next Lucky Gunner purchase. Maybe at a "Special Price"? Thanks. SHOT THIS IN MY GLOCK 26 GEN 4 AND IT IS VERY ACCURATE AND FUNCTIONS GREAT WOWWWWW!!!! WOW got here next day. First try. YES I WILL BE BACK . This is solid ammo. Exactly what you want for the range. Just wish it was a bit more affordable! 1000 rounds down and nothing but perfection. Accurate, clean, che well not cheap. Price is more than fair. Hey, it even looks pretty on the bench at my range. I fire 100 per week minimum and the wife does 100 a month. Ammo worked great. as always, Ammo shipped promptly and as always...LuckyGunner delivers! I've shot hundreds of S&B 9mm rounds at the range and never had a single problem. Very reliable and good value. I have shot over 5000rds of this stuff during my IDPA, days. I do not remember having not a one problem with this ammo! Shoots clean and is very very accurate! I found this ammo had enough power to knock down steal plates, with not a lot of muzzle flash! This ammo is perfect for IDPA. My CZ-75 loves this ammo! Great ammo for a good price. So far I have shot 200 rounds in my 92FS with absolutely no issues. Ammo is shoots very clean. I'll be buying more soon. I agree with the video, I'm always concerned about shooting clean ammo, and for the price, this ammo is accurate, clean and very well priced. I've run at least 1000 rounds through each of my Glocks, 19, 17 and 26 ....I've even run it through my old Taurus PT-908 ....And I haven't any issues with this ammo. Fired about 300 rounds at range. So far no FTF OR FTE. Shipped super fast in solid packaging. Great value. Always find what I need at Lucky Gunner. Found what I needed. Shipped quick and arrived early. Feeds through my P226's and HKVP9 without a hitch. Will buy again. Lucky Gunner kept pricing fair during the drought so I'll always come back to them. Everything was very fast and exactly as it should have been. Will order from Lucky Gunner again. Handles clean, shoots clean, no misfires, boxes are smaller than others allowing more efficient storage. hard to beat it. I have put several hundred rounds through a Springfield XDs 4.0 with no problems. The ammo appears to be loaded to NATO specs, so is hotter than domestic practice rounds. You will feel the difference in recoil. At 1280 fps, it shoots to the same point of aim as my +P JHP carry ammo, so it is great for practice. Shooting from a rest, it is one ragged hole, no flyers. This is quality ammo, and price and delivery that I have not been able to beat. Good product-fast delivery . Very satisfied with Lucky Gunner. Sellier & Bellot is my favorite ammo brand . I'm so happy to come across Lucky Gunner and their S&B deals. I'm a customer for life! My first time for S&B but have been very impressed. Good accuracy in my Glk .17 & 19. No FTFs or any other problems. Will buy again for sure. I purchase Sellier & Bellot because of their high quality brass that is great for reloading this winter. With a single stage press it is getting to the point of it's cheaper to buy new 9mm than to reload during the summer. To manny fun things to do outside. . .shoot, ride motorcycles work in the yard, (sorry, I said fun things). So, I clean and save my brass for snowy days. Been recommending Lucky Gunner to friends. Very fast shipping and good service. Very good product. Clean no misfires. Works great in my G17. Fast delivery and very pleased with purchase. Since my wife started shooting I will need to stock up more often. Works great in my Glock and her Walther. I have fired a minimum of 3000 rounds of S&B through my CZ75 Duty 9mm. Not once has it been a problem. It's a higher quality ammunition in my humble opinion and as previously stated it is (unfortunately ) under rated or maybe not as well known. I believe it would feed any brand semi-auto firearm without any problem whatsoever. Good choice! Will continue to shop here. Very fast shipping !and never a problem with this ammo. Easy ordering, top quality products ...makes my day ! Thanks Lucky Gunner. I am not going to waste your time evaluating 22 caliber ammo. I am just going to evaluate your company's performance. My order was miniscule compared to the average customer; and yet, you treated me as if I was spending big bucks. I received quality service from beginning to end. Your prices are competitive, maybe a dollar or two over some of the venders I deal with; but because of your treatment of me, I will have you at the top of my list of vendors. Your prices were good and the ammo shoot very good. I will keep coming back. My only complaint would be MY selection for shipping. My last delivery was left closer to the street than to my mailbox or my front porch. In the future, I will use a better choice for shipping. I ordered on wed afternoon and it was on my porch fri afternoon. Using with a S&W 910. Absolutely no problems. Cycles smoothly and handles nice. Customer service was excellent. I'll buy these again. happy, happy, happy!! Thanks Hiedi. As always fast service, Great Ammo! Lucky gunnner is all I buy from. They have the best prices and fast delivery and good product. My Glock runs very good with this ammo. 500 rounds and not one bad shell. I hadn't used this ammo before but after three boxes it has performed perfectly. Hadn't purchased from Lucky Gunner before either but they provided excellent service. Great service, and a great product! You cannot find better service than Lucky Gunner. My Glocks love the S&B ammo, never had a problem. Even with my custom built, that can be a little fussy about the ammo. Two excellent companies to deal with, no need to go anywhere else! I run the S&B 115 gr FMJ thru my CPX-2 and LC9 for range practice and Speer Gold Dot for serious carry times. I am thoroughly and positively impressed with the S&B ammo for accuracy and reliability - no problems at all with several hundred rounds in both weapons. Maybe the cost per round will get back down some day. I shoot IDPA and started using the S&B 9mm a few years back and it is great. I use a Glock G19 and it throws the empties way back over my shoulder!. Everyone wants to know where I get it but I won't tell. Just wish it were cheaper like it was a few years back. Lucky Gunner Is the only Place to Order Ammo....Period! I am still shooting the S&B ammo with no regrets. I also picked up some of the Federal Hydro-Shock 9mm and, without question, you can't go wrong with Federal/American Eagle. I also like the small packing of the S&B ammo. Buying from Lucky Gunner.......NO WORRIES!! Buying from other on line sources............keep your' fingers crossed! 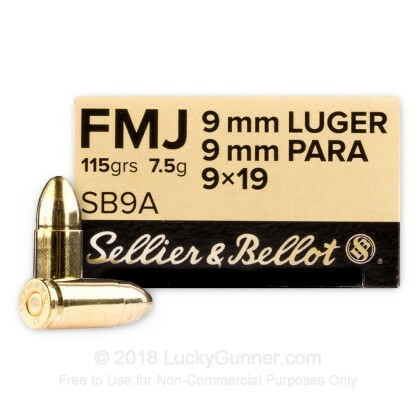 During the 9mm shortage, I tried a variety of brands and concluded that Sellier & Bellot, Federal and PMC are basically indistinguishable, and are all excellent. I have developed a small preference for S&B simply because the boxes are small due to the tighter spacing in the design of the plastic tray! You Can"t Ask For Better! I love Federal ammunition, but the S&B ammo is right there with federal. I would rather have a 147gr, but for target practice, you can't beat it. I have run about 3,000 rounds of both Federal(AM Eagle) and S&B ammo through my M&P 9mm with no issues from either. Outside of the occasional "pop, tap, and pop", I really like the S&B 9mm ammo. Very accurate and very clean POW! My Glocks only shoot Federal(high grain) or Gold Point(high grain), But S&B in a 9mm will kill cardboard with accuracy. Don't be afraid to buy. Always choose Lucky gunner for ammo.....PERIOD! Lucky Gunner is the only on line retailer I buy from now. If you buy ammo, it is at your door in three days or less! After searching my local stores for ammo, I finally turned to the Internet. I was unsure who to trust and the quality of their products, plus the aggravation of finding the ammo I wanted was either back ordered or out of stock! I stumbled onto the Lucky Gunner website and still unsure, placed my first of what I am sure will be many future orders. The prices can't be beat, the quality is outstanding and the customer service kept me in the loop of what was going on with my order. I've found my ammo supplier for future orders! This is good ammo. Many rounds through a PX4 and so far not a single issue. Recieved my shipment within 3 days. Good product at goood price. I have always had good servive from good people here. I have been using S&B ammo since I got my Glock 17 about 9 months ago. Never had any problem with this ammo. I will order more. With Lucky Gunner I can see what they have in stock and order. I got a thousand of these bad boys and ran em through my Kahr CM and CW9s and not one jam out of a thousand. Fantastic bullet here or at least Kahr loves em! Ammo is priced competitive, not a great bargain, but readily available. This is great ammo. I order it all the time, 1000rds at a time. Never had any issues with it. I use it in my Sig p226 and my Sig p250sc. Cheap, reliable, not very dirty, not problems at all. I've bought Sellier & Bellot many times before. Every time I'm amazed at the high level of quality at such an affordable price. You can't beat this stuff for 9mm target shooting. I have never had a problem with this product and the price can't be beat. Great Ammo! Had no jams in mine or my wifes Glock 17. Great customer service from Lucky Gunner!! Taking the kids to the range can run you through a lot of ammo. This product gives me the quality and value that makes the day enjoyable by all. Thanks Lucky Gunner!! My wife and I each shot 200 rounds through our Glocks. No problems. Sellier & Bellot has been my favorite since I began shooting and I've gone out of my way to try different brands. Very clean ammo, you can tell it was made with that special ingredient that cooks use... "love." So far no jams either. Value would get 5 stars if it was an even $200, found it cheaper locally recently. Reliable, Clean, No Misfires. Ammunition that matches all other ammunition. This ammunition ranks right up there with all other top brand ammunition that I have purchased. I started purchasing this ammunition approximately 2 years ago for training. Approximately 7k rounds later I am still using this ammunition. It has withstood the test and its performance has been outstanding in the Beretta, Glock, and Sig Sauer firearms that I use in traiing. If you can catch this ammo on sale it is very much worth it. I have shot around 2k rounds of the S&B FMJ 115 grain without a single problem. It is not the cleanest but it will work without a problem, my CZ eats it up like candy. It shoots straights and is reliable at a reasonable price. ran this through a smith and wesson 5906, a berretta 92fs, a glock 26, and a glock 17. ran great in all guns. Just bought my first pistol a CZ 75 SP01 and saw the deal LuckyGunner was offering on this ammo so I took a chance and ordered 1000 rounds. I could not be happier, I tell all my friends about the great ammo and the great deals at LuckyGunner. Fast shipping, good price, great products and service. You can not go wrong buying from LuckyGunner! I have shot 2k rounds of the S&B in 9mm fmj without any problems what so ever. If you can catch it on sale it is worth buying. I know I will be buying another 1k as soon as my current stock runs out. Lucky Gunner delivers the goods! This ammo seems higher in quality than some of the less expensive American ammo. It also seemed to be a little zippier. No problems of any kind in my Ruger or buddy's Kel-tec. Would definitely buy this from Luckygunner again. This is the prettiest center fire handgun ammo I have ever seen. They must put it through a tumbler after it is assembled because it looks like fine gold jewelry polished to perfection. The 50 round boxes are very small and don't take up a lot of space. The rounds seem to shoot straight enough but the charge is a little weak. I noticed this immediately when shooting a magazine that also had a few PMC rounds on top. The difference was so noticeable that I tried several mixed mags to verify the difference. My verdict, this is great for practice and the weak charge won't wear out your guns as quickly as regular power or plus + p rounds. I would never get caught after a session at my range with any of these in a carry gun. Great website, fast delivery, and great product with great prices. 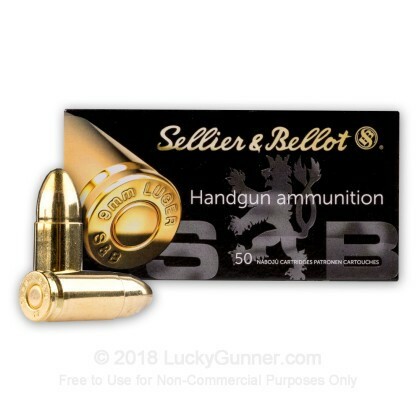 I am not an "ammo" expert in any way, but I do go through quite a bit of it, and this Sellier and Bellot deal was the best price for quality new brass I have seen. I received the shipment very fast, and I will definitely order from LuckyGunner.com again. I have come to love this ammo. I have been using it pretty much exclusively from a variety of sources for the past year. While it is not the cleanest it is consistent and I have had zero malfunctions in my XDs. Great value. This shoots great in HK's, Glocks, S&W M&P's, Rugers and Springfield XD's. Only one Failure to Eject out of 1000 rounds in a well maintained Glock 17 Gen 4. About 150+ rounds shot per handgun. The ammo looks great. The brass on the cartridges and bullets are pristine. Very shiny. It glows. Better than I thought I would get at this price. The cardboard box for each 50 rounds looked a little banged up. This concerned me a bit until the shooting started. Nothing to fear though. As I stated above, shoots great. Lucky Gunner ships in a hurry. However, I have had failures from UPS and FedEx to deliver on time. UPS lost the shipment and took an extra 7 days to ship. FedEx also lost a shipment and took 20 extra days to ship. Clearly, not Lucky Gunners fault. I would recommend this ammo and Lucky Gunner for your future ammo needs. I am on my 3rd 1000 round order of this ammo, it runs great with my M&P and my SR9C I've had only 2 FTFs with this ammo, not bad for 3000 rounds. Will continue to buy even if the price has gone up a little. Consistent, quality, accuracy, and performance on target! Does not jam or misfire. Great price and the delivery was exceptionally fast. Having so much fun that I will not wait to run out, but will buy another 1000 rounds immediately. Very pleased. I will order again. I've shot through 400 rounds so far at the range, and I've had nothing but great results. I will definitely buy this ammo again. Plus, I received the ammo very quickly after ordering! Lucky Gunner.com is my go to ammo supplier! I've bought the S&B 9mm from LuckyGunner in the past and bought it again recently. Great ammo and excellent service! Thanks!! Shot 1000 rounds through my Glock 17 and have not had 1 jam or misfire! Very good quality for the price and I really like the minimalist packaging which makes it easy to pack a lot of cases into my range bag. I am a fan and will use S&B regularly! Fired 500 rounds thru a Glock 19c. Works great with no problems. Lucky Gunner's service is great! My wife has been all over the targets at 10 yards till I got this ammo. Feeds awesome through her PT92. GREATLY improved her accuracy having good ammo. Just as cheap to buy a 1000 round box of this versus Tulammo or Wolf. For target ammo this can't be beat for the price and accuracy. Thanks LuckyGunner!!! Great ammo for the price. My Sig 226 ate this ammo up. Very clean and no problems. Great service and will place an order soon. 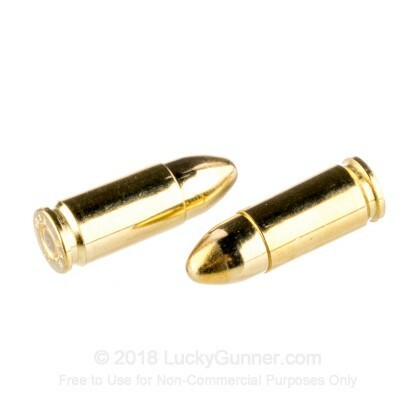 I searched many sites for the best value and kept coming back to LuckyGunner.com. All the positive reviews sealed the deal. I ordered and very happy that I did. The order process was simple since what I ordered was in stock. I didn't receive an email days later saying "Oh we are sorry but your order is on back order". They delivered what was ordered and quickly too. I finally had a chance to get to the range yesterday and I'm very happy with the results...150 rounds and no failures. I found the ammo to be very accurate and clean. I will be ordering again. Thank you LuckyGunner! This ammo is a good buy from Heidi and functions flawlessly in both of my CZ target pistols. Clean burning ammo and well packaged. Shipping from Lucky Gunner is very efficient as well. I'll purchase this product again. I have tryed different brands of target ammo & now only shoot the Sellier & Bellot brand. Lucky Gunner is the way service & websites should all be. Non-payed spokesman, just a happy customer. Fires clean and no misfires. I ordered this product on a Tuesday afternoon and delivery came before noon the next day. I shopped before I ordered and couldn't beat the price. The product is clean and flawless in my Ruger P94. Told a bunch of my shooting friends and they liked what they heard. I will be back for more ~ thanks L G.
Shot over 500 of my 1000. As usual, cheaper ammo always leaves the gun dirtier. Other than that, great price, works great, will be back for more. Good value, quality, and performance. Fired 300 rounds through my Glock 17 without a single problem. When I broke my gun down it was very easy to clean. Good stuff. This is great range ammo. No issues feeding through my XD Service, Kimber Pro Carry II, Kahr CW9, both of my RIA, one GI, one Tactical and my Beretta PX4 Storm FS. Accurate, dependable. I'll get more as soon as I can. My Glock 19 fires this ammo without any problems. I will buy more! I have an FNX 9mm and bring S&B ammo out to the range all day, love it. Fired 1000 rounds through my Glock 17 gen 4. Performance, Value and Quality as advertised. Not one problem. Very little residue when I cleaned my Glock. This ammo goes bang every time I squeeze the trigger of my Glock 19. Can't ask for more. And Lucky Gunner is an excellent supplier. Great ammo- blisteringly fast shipping- even over a holiday weekend. I've only shot 100 rds out of the case so far, but, i have to say it's wonderful ammo. I used my Glock 17 Gen 3 (with competition trigger job. Means lighter striker spring) and it preformed flawlessly. Pretty clean, definitely accurate, goes bang every time and as an added bonus comes out at a faster than avg. 9mm @ 1280 fps. Seriously, you can't go wrong with this ammo. Finally, this is my second order of a case of 9mm from Lucky Gunner and their shipping was (as always) super fast. Thanks Guys (and Gals :-) for running a tight ship with great prices. I ordered a case of S&B on a Wednesday and got it the next day. I must say I was impressed with the customer service and delivery. I've fired 350 rounds from a Glock 19 and a Ruger LC9 with no problems. Cleaning my weapons after range sessions was pretty easy. I've fired different makes of ammo and S&B is some of the cleanest ammo that I have fired. The price of this stuff is a real bargain. I've recommended S&B and LuckyGunner to those in my shooting community and have gotten some great feedback. Thanks LuckyGunner. I will order more and so will my friends. Fired 500 with no jams..poor zombies. I previously purchased and fired 1000 rounds of this ammo through my Beretta 92fs. It performed flawlessly and seems cleaner than other brands I have used. The price is close to as good as any for a brass cased FMJ round. My Glock 19 has no problems with this ammo. Nice and clean to shoot. I've been using it in Glock matches for the last couple of years. I took a 1st place and am consistently in the A group. Ammo was fantastic, the price was fantastic absolutely no complaints. We've shot a few rounds to test them out in our guns, but mostly they're going into our reserve. Great ammo! Very accurate & reliably fires great in my Stoegar 9mm. Also has more power & speed down range than some other loads I've purchased. Hope they never lose site on quality. They have great ammo! Lucky Gunner is a company that still gives personalized service to their customers. My experience with their service has been flawless, fast, and reliable. I have recommended Lucky Gunner to several of my gunner friends because of their excellent service and prices. Good looking ammo. Shoots straight, ejects hard. Cleaner that the CCI brass I put through my FNP-9. A fine deal. NO FTF / FTE. I have used this ammo in local IDPA matches and its very effective on steel. Shoots clean and reliable with no noticeable issues with accuracy. Great value for the price. I don't know if Id say it was KC's review that it was better than S_X (lol) but it is amazing ammo, I feed it to my sig 226 and it loves it. I have used over 10000 rounds of this stuff and cant remember an ammo related FTE or FTF error. I did have some using this ammo but it was caused by my experimenting with a recoil reduction spring system that threw the slide cycle time off. As soon as I replace the guide rod etc they were flawless. No complaints except it is a little dirty. But I clean my guns after every firing anyways so no big deal. Excellent experience for range time. My Sig Pro gobbles these things up! Not one FTF FTE in about 400 rounds. LuckyGunner had very fast shipping and I got them faster than expected. No problems with 400 rounds through a Ruger P95 and LC9(wife) and a Walther PPQ(son). Clean all the way, great price too. Lucky Gunner is great. I already ordered again- this time JHPs instead of FMJ. Case of 12ga. shells heading my way. Got my first order at my door w/in 5 days. Telling everyone to buy from LG, even my local FFL guy. Great ammo. Very fast shipping. Great for storage due to small size of case. A+++ to Luckygunner for the great customer service. Great pricing fast delivery as well the brass can be reloaded . I am looking forward to my next order from Lucky Gunner. 500 rounds without a malfunction in a Glock 17, and no cleaning........very happy with it. And of course, can't beat Lucky Gunner for fast shipping and customer service! Reliable product for an old and well established company. Have recommended it and LuckyGunner to friends. Great, as usual. The product , the delivery the customer service . The order taker a real gun guy . My CZ loves this ammo. Not much to say other than perfect performance at a nice price. The ammo is cleaner than several brands I've tried, my barrel cleans out easier after S&B. I'm a happy camper. I can't complain about accuracy with it, uniformity between rounds seems good as well. As for Luckygunner, their service was outstanding. They really want to take care of their customers and try to make sure everything is right. Thanks! I'll continue to purchase this ammo at LG, hopefully for a long time to come. I use this in my S&W MP9, at the range and elsewhere. It performs great, no FTL, FTF, etc...I like how it is packaged too, compact boxes. There are no gun/ammo stores close to where I live so having the convenience of home-delivery is great. Very pleased with LuckyGunner price and service and fast shipping! I've put over 3000 rds of this stuff through my Berretta PX4. Never had a misfire, fail to feed or eject. Great stuff for punching holes in paper. It's the only range ammo I shoot. Very clean too. It's in a reloadable brass case. Accurate & performs great in my Hi-Point 9mm. These rounds also have a bit more pop than some other loads. It's a winner! Ordering was easy dilivery less was less than a week . my Glock 17 is not fussy with ammo as long as it is kept clean .This ammo should work without problems . Prices on Lucky Gunner cannot be beaten . I highly recommend Lucky Gunner ! I've shot 1300 rounds of this ammo using two different guns and not had any problems. 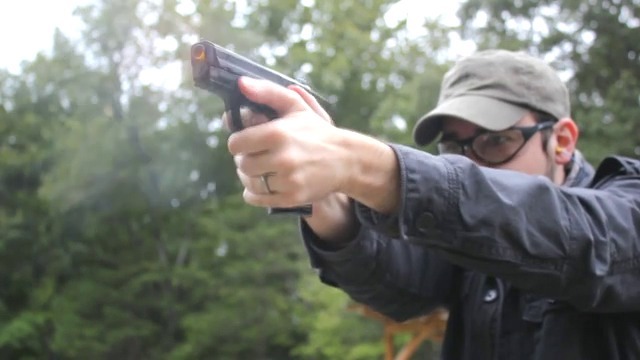 Most recently, I took it for a day defensive pistol training and fired 850 rounds through my S&W M&P 9 in six hours without a single misfire. This ammunition is top notch. Buying it from Luckygunner.com is a good experience, as well. Good prices and fast shipping. What a combo! I've put about 1600 rounds of this ammo through a Beretta PX4 and a SW M&P without a single misfire. This is excellent range ammo. Great ammo, decent price, I've been with Lucky Gunner and I'm stayin! I've been shooting this brand for about two years. I shoot about 2,000 rounds a season and not had any jams or misfires. I am shooting a Glock 19 9mm. I can't beat the price in my area, so I have to pay the shipping, but Lucky Gunner is a great outfit. The website is first rate as is their inventories. These rounds are decent for the range and price. Sometimes the casing don't effectively eject but no jams. A bit dirty after 200 rounds. I would definitely recommend. This ammo works flawlessly in my Glock 17. It is accurate and clean, perfect for target practice. Really good ammo for the range. No problems with FTF,FTE. but not much total ejection distance. Some of the casings hit you in the head, DUCK! For the money this a good buy. great value for the price. very clean ammo. compact boxes save room for storage. I have shot 2,500 roungs of this Ammo through my XDM 9 Compact, Beretta PX4 Storm Companct, Walther P99c, and Kel Tec PF9. Not ONE SINGLE FTF, FTE. It has been flawless at the Range. So long as Luckygunner keeps the price of this ammo, I'll keep ordering! I just ordered another 1000 rounds from Luckygunner. Thank you for the SUPERFAST shipping on every order. Shot several hundred rounds and while performance is fine the powder residue is extensive! So far not one jam in my SW MP9 but enough black powder residue everywhere in the receiver. I’ve purchased and fired 2-3k rounds over months… M&P 9, SA 1911, Sig 226… not a single issue. The only other range ammo I’ve found as good is American Eagle… WWB is getting a bit overpriced. LG pricing and shipping is great! I purchased 500 rounds of this ammo. not one misfire, hang-fire or FTF in the 100 i've sent down the pipe yet. I'll likely be buying some more fairly soon. Thanks LuckyGunner.com, you're a fantastic resource. Great Performance, Great Value and Great Quality! I ran a 1,000 rounds threw a new Ruger SR9 and shot flawlessly. Not a single jam or misfife! Good price but after $30 in shipping I may try and find a closer source in the future. But was a good experience purchasing threw here none the less. But sadly shipping charge is a HUGE factor in increasing the price of each round. Halfway through 1000 round order, with no failures to fire/failures to feed. Pretty clean, as well, through my P229 stainless elite. Good round for hi-volume practice at the indoor range. Shot all 1000 rounds without a single misfire or hang-fire. Combined with a promotion code, this ammunition is the best and cheapest anywhere. Been using this ammo since i bought my Beretta Px4 Storm. Never had a single jam with this ammo, using it right now for Police Academy range time. Can't go wrong buying it. The indoor range where I go sells this round for use in its rental 9 mm hanguns. I use it with my Glock 19 Gen 4. So far had used 500 of the 1000 rounds, no FTF or FTE. Just a few ejections to my head, but I suspect that is the Glock and not the rounds. I like the product and it is clearly cheaper than buying it at the range. I haven't fired any other rounds, but have read that it is a clean round in comparison to some others. shot abot 700 rounds through my sp01 all went bang. Pretty smoky though. 1000's rounds though my G17,not 1 single issue. I will purchase again. Shot well over 1000 rds of this through my 9MM + a bunch through my .40. No FTF, FTE or anything. Burns clean. This is my range ammo of choice. I won't use anything else if this is available. Can't beat the price either. Have been using to 'break in" a new Walther PPS. First 300 rounds have been flawless with no FTF/FTE. 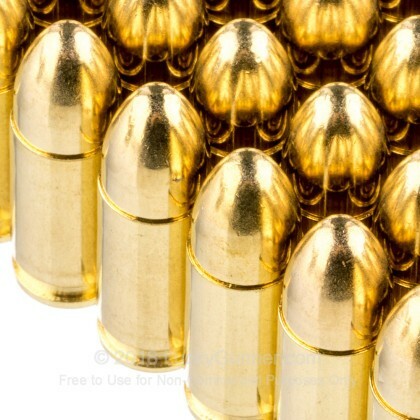 Great value for 9mm range ammo, still with quality brass case. I've been very pleased with my purchase and will purchase again. Ammo is good quality, no FTF or FTE on a new Glock 19 Gen 4.
of any kind,planning to buy another 1000,rounds again,GOOD clean ammo. I am a first time gun owner. I purchased 1000 rounds of S&B from lucky gunner a few weeks ago. Thus far, I have gone through approximately 7 boxes (350 rounds) in my XDM compact and I have not had any issues. I am definently buying more. Took 500 rounds of the S&B 9mm ammo to the range to shoot through my Ruger SR9c. The ammo worked flawlessly with no FTE or FTF through 500 rounds. Great range ammo. I bought this ammo for my wife's Beretta Px4 Storm. The ammo has performed with fail. No problems what-so-ever. She is dead on target with no strays. Accurate and reliable. You can not go wrong buying Sellier & Bellot. I will be ordering another 1000 rounds shortly. Add Lucky Gunner's excellent service and it is a winning combination. The ammo works great in my Glock 19, very fast shipping, would recommend to others. This is a 5 star product and cost. Luckygunner.com is the best on-line retailer I have ever dealt with. Keep up the good work. Ordered S&B 9mm on Thursday and on my doorstep Saturday morning! Can't wait to try the ammo @ the range. Thanks for the fast service! Great ammo....great price....great uqick service. What more is there to say!!!! I bought 1,000 rounds of this 9mm S&B. I was a little skeptical at first. I like Magtech, but the rounds are really dirty. I just got back from an intensive 4 day defensive handgun training at Front Sight and fired over 800 rounds of this ammo in a CZ SP-01 Shadow and a Glock 17 Gen 4. NOT A SINGLE FAILURE! Not 1 issue! The guy beside me had a new Springfield XD with PMC ammo and had multiple FTF and FTE issues. I don't know if it was his ammo for sure BUT my gun with S&B ammo was PERFECT. I cleaned my gun last night and while it was dirty (you would expect that after 800 rounds in 4 days), it was less dirty than firing 200 rounds of Magtech through it. I HIGHLY recommend this ammo. In fact, I'm getting ready to buy 2,000 more rounds today! I purchased 1000 rounds of 9mm - 115 gr FMJ - Sellier & Bellot - The quality is excellent and so is the price. Shipping was quick! What more can you ask. My KelTec PF-9 loves this stuff. I prefer it to most of the others I've tried, mainly because it just feels softer on the hands, and still gets the job done. It performs group and recoil wise just like Hornady TAP (which I use for personal defense in the PF-9), which makes this a great practice ammo. This ammo is nicely packaged and has functioned perfectly out of several pistols. No malfunctions in 500 rounds. Great Price, Good Quality, Great Service & Website! I purchased 1000 rounds of this ammo and had no complaints. It served the purpose for target practice and I will continue to buy from Lucky Gunner. Getting ready to purchase another 500 rounds to blow off! I have a XD9SC and take it to the range once a week. This is a great price for target/range ammo. It has performed flawlessly. good for price, but thats it. Great ammo. Worked well in my Uzi carbine. This was a very good price for quality ammo in bulk. S&B has low recoil. accurate. I shot close to 2k rounds never had a problem. My first purchase has been a great experience.The product was excellent. The service even better. I will be a customer for a long time. Great prices , great website! A great range ammo at an unbelievably great price. As long as Lucky Gunner keeps these deals coming I will be a customer! I have run through almost 1,000 rounds with no misfires. These rounds shoot cleaner than some other rounds I have shot. Excellent rounds for non-USA production. The only problem was I only got 1000 before they ran out. My slide fire tends to eat it up fast. Just value for the money. I've shot the JHP version of this ammunition and loved it. Thank you LG. This is my first 1000 rd purchase, but I have shot over 500 rds of S&B prior to this purchase. More than pleased with this ammo and how prompt Lucky Gunner is with their shipping and follow up customer service! Will continue to my business with them and will recommend them to my shooting buddies! I have S&B before and always shot great!! !This is the first time buying from LuckyGunner,but won't be the last.Great deal at a great price,my RugerP95DC just loves this stuff!!!! S&B + LG = A Happy Shooter! My CZ 75 loves these! Burns clean and always feeds and ejects. At these prices you can't go wrong with S&B ammo! I will buy more! Ordered my 1000rds through LG and can't say I was left wanting. Great job LG my XD and soon to be 75b love you guys. Soon as I'm done I will be ordering more from this site. No issues thru S&W MP Pro-normal residue and consistent patterns. LG service is outstanding. S & B well known my Glock Gen4 eats it up. The ammo looks good and is consistent. Arrived quickly as usual. My Glock 17 Gen4 shoots well with it. It seems a little less dirty than Rem UMC. At this price I'm more willing to practice and keep the skills up which is what it's all about. Okay, it's fun to practice too. Especially with a good gun-ammo combo. Ammo was very clean; 300 rounds shot flawlessly in my Ruger sr9c; shipping was very fast; what more can I say? Perfect ammo for practice. Friendly order process, FAST shipping, 4000 rounds to date and no problems. All things considered, good value - I can't reload for this price! These rounds are the best I've found for the money. No miss fires or jams. Tight patterns. Very reliable in my XDM. No jams or misfires. Four stars for "value" because even though it was about the cheapest stuff I found, I think it is still on the expensive side for buying bulk. However, I will still be buying it again. A great value...no problems with this ammo. My Glock 19 loves it! Shot over 200 rounds with my new Glock 19 without a problem. Will be ordering more very soon. AS ALWAYS, THE PRICE WAS GREAT, THE SHIPPING WAS SUPER FAST(NEXT DAY), AND THE AMMO HAS BEEN FLAWLESS SO FAR. shot 500 rounds from my springfield xd9 subcompact. no problems, no worries, no jams. will stick with this ammo for target practice. I did not expect such quality from the lowest priced ammo. Low recoil and very accurate. I'm shooting it in GSSF. Slightly cheaper than my reloads. I only gave it 4 stars in the "value" category because all ammo is way overpriced. Thanks to the economy. BTW, shipping was amazingly fast. I just got back from Front Sight Firearms Training Institute in Nevada and put about 700 rounds of 9mm Sellier and Balot through my CZ 75b. Flawless and accurate. This is the best buy for range ammo on the internet. Lucky Gunner got the ammo here fast and in great shape. Thank you for the great customer service! Good ammo for a good price. My SR9c eats these well. I have put well over 1000 rds of this through my Ruger SR9 over the course of the last year. Not one single FTF or FTE, and I do not find the ammo to be dirty at all. I have shot much dirtier ammo than this. I love this stuff and I highly recommend it. 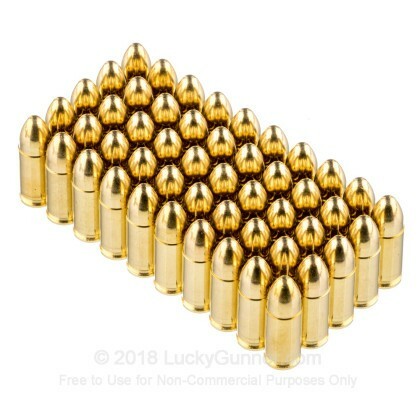 We'd used this ammo at the range prior to buying from Lucky Gunner so had no concerns buying in quantity. My wife and I, fired 500 rounds in our S&W M&P and Springfield XDM with no problems. The service from Lucky Gunners was very good and our order arrived in good condition. Will purchase from Lucky Gunner again. 600 rounds through Springfield 1911 Loaded, and my M&P 9 pro, not one issue, very consistent ammo. I average 2k rounds a month, various brands, and didn’t find the ammo any more “dirty” then well known range brands… YMMV… The price point is very good for range ammo, I will buy more. With all ammo, buy a small quantity and confirm you own experiences. Great ammo, great price and fast shipping. Ordered on a Sunday got the product on Wednesday excellent service price and product. Ordered 1000 rounds have shot 500 so far and zero problems. I will deff be ordering more. As others have mentioned, it's a bit on the dirty side, but between myself and the missus, shooting sessions can easily reach 600 rounds or more in a day, so what wouldn't be dirty? As for performance: it feeds, fires and ejects consistantly, No misfires, no failure to feed. I've put this ammo through a 92FS, 17, and an SR9, and shot a LOT of it. Overall, a solid performer on the range, and exceptional value. Go for it. Hey, I bought this expecting better quality. I spend more time cleaning than shooting. I bought 500 rounds of this and shot 300 rounds through my Beretta 92 and man was it dirty. Jammed once and misfired 3 times. Not bad out of 300 but that's .60 cents I lost. I really don't think you can go terribly wrong with this ammo due to the price and it is better than reloads 9never know if it will fire or not). Now accuracy, that is up to you not the ammo as it will only go where you aim it. I found this ammo to be very dirty upon cleaning after only 100 rounds. Cheap powder was used in this cartridge hence the low price. If you don't mind taking extra time cleaning, this is an excellent cartridge for the money. I don't mind doing extra cleaning because I clean my guns after each shooting session. I shot this cartridge with my Ruger SR9c Ccompact 9mm handgun. No jams and no misfires. All in all, this is decent ammo for the money. After all you are just going to shoot it away anyway, right? Just fired 600 rounds in 4 days, with no misfeeds or misfires. Awesome! This is a great plinking ammo, no issues in my cheap high point 9mm auto. This is not the first order I have made from LG, but the experience is always a pleasant one. The product is delivered accurately and in a timely manner everytime. I fired this at a recent USPSA match and was impressed . My scores need improvement but the ammo was great.